Department of Pharmacy, Noakhali Science and Technology University, Sonapur, Noakhali-3814, BANGLADESH. Department of Pharmacy, Atish Dipankar University of Science and Technology, Banani, Dhaka-1213 BANGLADESH. Bangladesh National Herbarium, Mirpur-1, Dhaka-1216 BANGLADESH. Spices like Allium cepa (onion), Allium sativum (garlic), Zingiber officinale (ginger) etc are indispensable part for the preparation of our daily food and are reported to possess compounds, which have varied with beneficial biological effects. 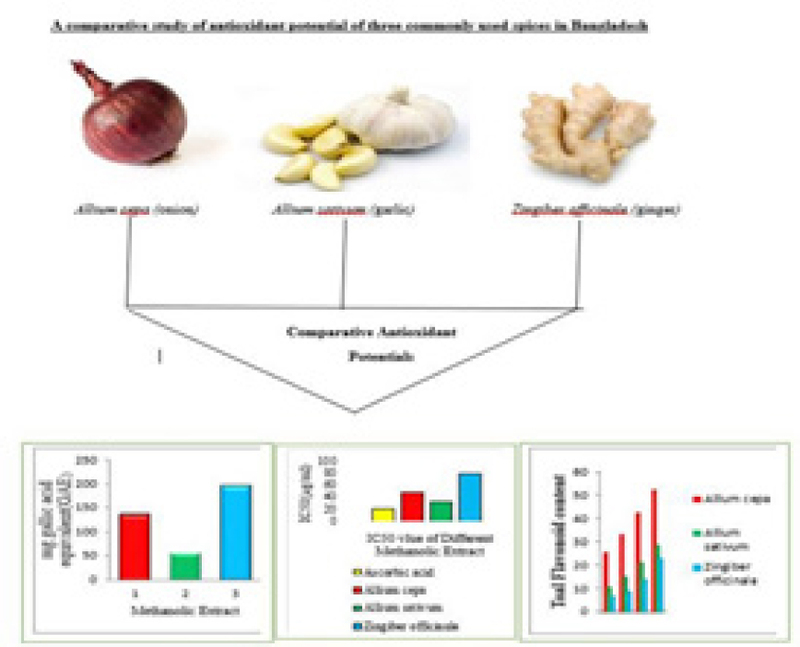 The present study was undertaken to evaluate and compare the antioxidant potentials of ethanolic extracts of A. cepa bulb, A. sativum bulb and Z. officinale rhizome. All the extracts of these three spices were subjected to total phenolic content, total flavonoid content and DPPH radical scavenging assay for determination of antioxidant activity. Data are tested and tabulated by using SPSS software of 10 version. The present study revealed that Z. officinale extract exhibited the highest DPPH radical scavenging activity (IC50 value of 32.439 (µg/ml)), followed by A. cepa (IC50 value of 48.077 (µg/ml)), and A. sativum (IC50 value of 78.289 (µg/ml)) respectively. The study also supplicated that Z. officinale has higher phenolic but lower flavonoid content at different concentrations than A. cepa and A. sativum. According to our present study it can be summarized that these spices have antioxidant activity and can be used as natural drug sources for the development of potential preventive intervention in case of free radical-mediated diseases. Therefore, consumption of these spices might be helpful in combating the progression of various diseases related to oxidative stress. The cells in our body are exposed to oxygen every day. Oxygen is important for body’s normal physiological demands, but exposure to oxygen also causes oxidation reactions.1 It is well recognized that oxidative stress results due to the excessive generation of free radicals and resultant tissue damage is the hallmarks of different refractory disorders and cell death.2,3 Over time, free radicals can cause a chain reaction in the body that damages body chemicals, DNA and other parts of cells and can initiate peroxidation of membrane lipids, leading to the accumulation of lipid peroxide, which is related to aging and other diseases including atherosclerosis, arthritis, ischemia and reperfusion injury of many tissues, central nervous system injury, gastritis and AIDS. Antioxidants are our first line of defense and indisputably it is necessary to suppress free radical in in-vivo to eradicate the toxicity induced by free radicals.1, 4 Antioxidants may stop or limit the damage occurred due to free radicals by giving electrons to the free radicals and neutralizing them. Body uses antioxidants to stabilize the free radicals and that’s why they are also known as “free radical scavengers”. Antioxidants have potential in promoting health and also lowering the risk for cancer, hypertension and heart disease.5 Basically from last decade due to profound dedicated studies to natural therapies, edible plants have been a vital source of natural products for sustaining human health.6 According to various studies it can be sated that plants possess variety of chemical constituents with definite biological activities and therefore useful in treating various ailments.2 Recently there has been an upsurge of interest to search for novel, powerful and nontoxic antioxidants to counteract free radical mediated disorders in human and this approach also substantiates many synthetic antioxidant compounds because of their potential detrimental effects to the lugs and liver.4 The major sources of natural occurring antioxidant are edible plants, especially spices and herbs.7 Most of the available species possess antioxidant properties due to the presence of phenolic compounds and found to be associated with lower incidence and lower mortality rates of cancer in several human populations.8 Spices are the potent sources of many polyphenolic compounds such as flavoids, flavanoids, phenoliccompounds, phenylpropanoids, anthocyanins, anthraquinones,which are considered to have good antioxidants capacities and could potentially replace the synthetic antioxidants in food systems and offer additional health benefits.9,10 Consumption of spices also has been implicated in the prevention of cardiovascular diseases, carcinogenesis, inflammation, atherosclerosis.11 Generally, in Bangladesh Ginger (Z.officinale), Onion (A. cepa) and Garlics (A. sativum) are most widely used spices in Bangladesh. As Bangladeshi people regularly eat these spices with their foods, so these spices can be alternative for synthetic antioxidants.12 As a part of perpetual investigations on Bangladeshi medicinal plants, ethanolic extracts of these three common food spices were investigated to determine their antioxidant potential in terms of total phenolic content, DPPH radical scavenging assay and total flavonoid content in a comparative way. In this paper we narrate the results of such studies in order to orient future investigations towards new, potent and safe bioactive compounds. DPPH (1, 1-diphenyl 2-picryl hydrazyl), trichloroacetic acid, gallic acid, standard acetyl salicylic acid were obtained from Sigma Chemical Co. Ltd, (St. Louis, MO, USA). All other chemicals and reagents were of analytical grade. The Bulb of A. cepa, A. sativum, and rootstock of Z. officinale was selected for investigation. For this gift investigation bulb of A. cepa, A. sativum& rootstock of Z. officinale was collected from native market of Noakhali, Chittagong, Bangladesh. The collected spices were processed in keeping with the strategy of Atata et al., 2003. 13 Spices were then dry at temperature for fourteen days so ground into a rough powder with the assistance of an appropriate grinder. The powder was hold on in an exceedingly airtight instrumentality and unbroken in a cool, dark and dry place till analysis commenced. Concerning 250 weight units of every dried ground spices were taken in an exceedingly clean, flat-bottomed glass instrumentality and soaked in one thousand cubic centimeter of ninety eight plant product. The instrumentality with its contents was sealed and unbroken for an amount of twelve days, stirring each twenty four hour employing a sterilized glass rod singly. The full mixture then filtrated with filter artifact followed by passing through Whatman paper no. 1 (Sargent, Welch, USA) singly. The filtrates obtained were focused beneath vacuum in an exceedingly rotary evaporator at 40°C and hold on at 4°C for additional use. Total phenoplast contents of all spices extracts were determined mistreatment Folin-Ciocalteu chemical agent as delineated by Singlaton and Rossi 1965,14 where 0.5 cubic centimeter of extract resolution (conc. 2 mg/ml), 2.5 cubic centimeter of Folin-Ciocalteu chemical agent (diluted ten times with distilled water) and when five minutes two.0 cubic centimeter of Na2CO3 (7.5 the troubles w/v) resolution was added. The mixture was incubated for two hour at temperature. When two hour the absorbance was measured at 765 nm by UV-spectrophotometer and mistreatment the quality curve ready from acid resolution with totally different concentration and therefore the total phenols content of the sample was measured. The phenoplast contents of the sample were expressed as mg of GAE (gallic acid equivalent)/gm of the extract. Antioxidant activity of the spices extracts and also the standards was assessed on the idea of the unconventional scavenging result of the stable DPPH radical, victimization Brand-Williams et al. 1995 methodology.15 within the experiment two.0 mg of the every of the extracts was dissolve in alcohol.2.0 mil of an ethanol resolution of the extract at totally different concentration (100 to twelve.5 μg/ml) were mixed with three.0 mil of a DPPH fuel resolution (20μg/ml). Once thirty min reaction amount at space temperature in dark place the absorbance was measured against at 517 nm against alcohol as blank by ultraviolet photometer. Where blank is that the absorbance of the management reaction (containing all reagents except the check Material). Extract concentration providing five hundredth inhibitions (IC50) was calculated from the graph aforethought inhibition share against extract concentration. Water-soluble vitamin was used as positive management. The total flavonoids content of plant extracts were determined by methodology delineate by Zhishen et al. 1999 methodology.16 100.0 µl extracts were mixed in ethyl alcohol was additional to a ten milliliter volumetrically flask containing four milliliter of water. At zero time, 0.3 milliliter five-hitter nitrite was additional to the flask. Once five min, 0.3 milliliter of 100 percent chloride was additional. At 6 min, a pair of milliliter of one M hydrated oxide was additional to the mixture. Directly, the mixture was diluted to volume with the addition of two.4 milliliter water and completely mixed. Absorbance of the mixture, pink in color, was determined at 510 nm versus a blank containing all reagents except samples of extracts or fractions. Rutin was used as normal for the activity curve. Total flavonoid content of the extracts and fractions were expressed as g rutin equivalents (RE) per one hundred gram of extract (g/100g). All the above assays were conducted in triplicate and repeated threes for consistency of results and statistical purpose. The data were expressed as Mean ± SEM and analyzed by using SPSS software of 10 version. Three most popular spices commonly consumed by the Bangladeshi people were elucidated for antioxidant abilities by determining their total phenolic content, degree of scavenging DPPH free radical and total flavonoid component. As phenolic compounds are known to responsible for free radical termination that’s why they are also acknowledged as potent antioxidants.17 Various previous investigations revealed that higher the level of phenolic content represents greater antioxidant activity. 3 Antioxidant test by determining the total phenolic contents of ethanolic extract A. cepa, A. sativum and Z. officinale are given in Table 1. Total phenolic content of the plant extracts was examined by using Folin-Ciocalteu method and was expressed as gallic acid equivalents. The results in Table 1 exhibited that, the ethanol extract of Z. officinale (Zinger) have the highest phenolic contents (196.58 mg gallic acid equivalent per gram plant extract) and A. sativum (Garlic)have the lowest phenolic content comparing other two spices. So, the order of the phenolic content among these three spices are Z. officinale > A. cepa >A. sativum. One of the most simple, rapid and sensitive methods for assaying antioxidant ability is DPPH-free radical scavenging activity based on the ability to donate hydrogen ion. 2,18 In the DPPH assay, the ability of the investigated extracts to act as donors of electrons in transformation of DPPH radical into its reduced form DDPH*-H was examined. The results of DPPH free radical scavenging activity of ethanolic extract of A. cepa, A. sativum and Z. officinale are given in Figure 1 and 2. Here we used Ascorbic acid as standard whose IC50 value was 21.37 (µg/ml) and we found IC50 value of A. cepa, A. sativum and Z. officinale 48.077 (µg/ml), 78.289 (µg/ml), 32.439 (µg/ml) respectively. Among the three different plant extracts tested, interestingly, in the DPPH radical scavenging activity of the Z. officinale extract exhibited DPPH radical scavenging potential comparable with that of standard ascorbic acid. The scavenging effect of the three different plant extracts decreased in the order of Z. officinale> A. cepa> A.sativum. The data obtained indicate that Z. officinale is more powerful free radical scavenger than that of A. cepa and A. sativum. However, the scavenging property of these three spices may be due to the presence of phenolic and polyphenolic compounds as stated in previous test. 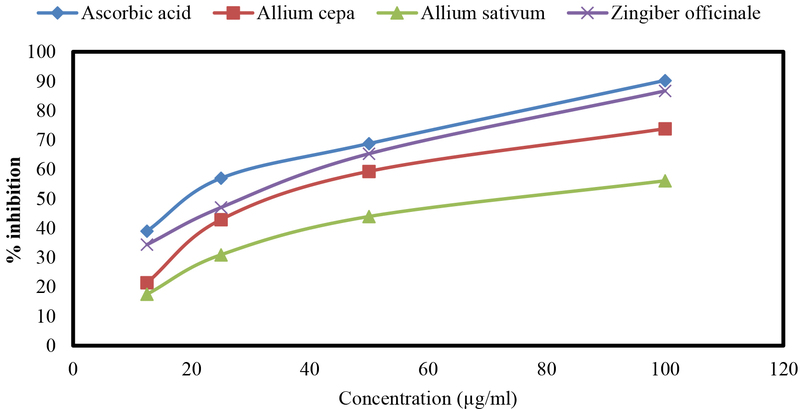 A comparison of total flavonoid content present in A. cepa, A. sativum and Z. officinale at different concentration of extract solution. It has been acknowledged that flavonoids display antioxidant property and they are supposed to be played considerable effects on human health and nutrition. 19 They also inhibit enzymes such as aldose reductase and xanthine oxidase. They are able of effectively scavenging the reactive oxygen species because of their phenolic hydroxyl groups and also responsible for chelating process.20, 21 Flavonoid content is increased when concentration of the extract is increased. The total flavonoids content was determined spectrophotometrically using aluminum chloride. The content of flavonoids was expressed in terms of rutin equivalents. 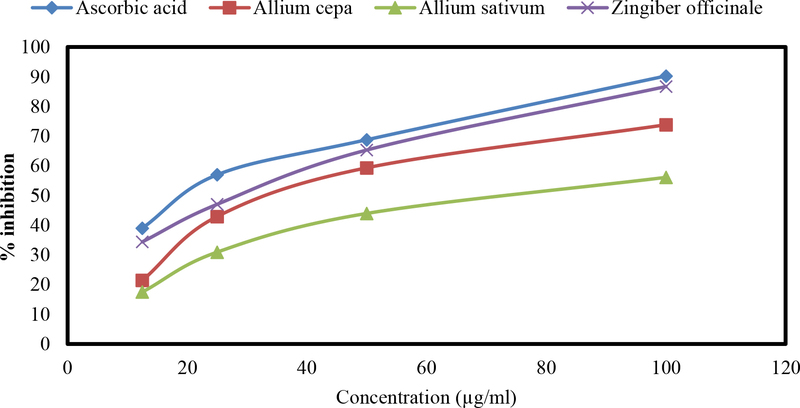 The results in Figure 3 showed that, the total flavonoid contents of A. cepa were reported to have the highest comparing to A. sativum and Z. officinale. On the basis of the findings of the study it can be concluded that the ethanol extracts of the bulb of A. cepa, A. sativum and rhizome of the Z. officinale possesses strong antioxidant radical activity. Nowadays, many synthetic antioxidants is used but their possible toxic properties for human have been evident. Therefore natural products with strong antioxidant properties can be used as replacement of synthetic antioxidants. A. cepa, A. sativum and Z. officinale can be considered as good sources of natural antioxidants for medicinal uses such as against aging and other disease related to oxidative stress. Hence they are recommended as good food supplements in daily diet which act as natural antioxidants that can protect us from many diseases caused by ROS. But further investigation is needed to understand the in-depth mechanisms through which these effects are exerted and also study the biological effects of antioxidant-rich spices on oxidative stress related diseases. Spices like Allium cepa (onion), Allium sativum (garlic), Zingiber officinale (ginger) etc are indispensable part for the preparation of our daily food and are reported to possess compounds, which have varied with beneficial biological effects. According to our present study it can be summarized that these spices has antioxidant activity and can be used as natural drug sources for the development of potential preventive intervention in case of free radical-mediated diseases. Therefore, consumption of these spices might be helpful in combating the progression of various diseases related to oxidative stress. Authors are very much grateful to department of pharmacy, Noakhali Science and Technology University for their heartiest support and co-operation. Md. 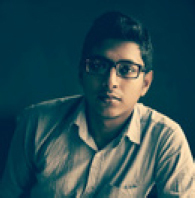 Saddam Hussain, a very recent expert in this field, presently working as a lecturer of Pharmacy department of Atish Dipankar University of Science and Technology, Dhaka, Bangladesh. He has achieved B. Pharm and M. Pharm degree with excellent academic records from Noakhali Science and Technology University, Noakhali-3814, Bangladesh. He is directly involved in this research work. He has many publications. He also represent his research work at considerable number of national and international conferences. Financial disclosure FUNDING We do not have any private or public organizational founding. All members of research group having personal contributions for found. Presented by AVAILABILITY OF DATA AND MATERIALS Data and materials are available in the department of pharmacy, Noakhali Science and Technology University.